Jadgeschwader I (JG I) of the Imperial German World war I Luftstreitkrafte was nicknamed the 'Flying Circus', either because of its brightly painted planes, or due to the fact that it moved about the front in trains and was equipped with tents. Which of these is correct is lost to time. JG I was commanded for a while by Manfred von Richtofen, so the alternative name was 'Richtofen's Circus'. Unlike children, the Allied airmen were not happy when this circus came to town. Flying Circus Deluxe is the elder brother of Dan Verssen's game 'Down In Flames'. From what I have read there is very little difference in the original version of both games. 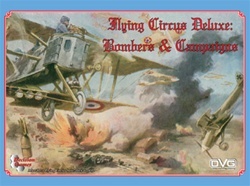 Flying Circus Deluxe is actually the game 'Flying Circus', and the add on 'Bombers and Campaigns' all in one package. 2017 has been a big wargaming year for me. It has also seen some experimenting on my part with game types I have never played. I just did a review of my first block game, and now this game is my first card game. 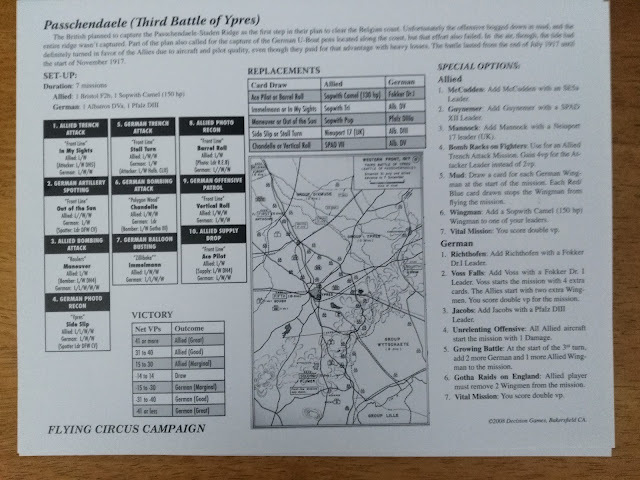 I had thought that 'real' wargames had to contain maps, hexes, and cardboard counters. I could not have been more wrong. Flying Circus deluxe is listed by Decision Games as a 'fun and quick' game. This is proof positive that there is truth in advertising. This deluxe game gives the gamer the chance to play the basic or advanced games. The basic game is where the 'fun and quick' really shines. The 'Bombers and Campaigns' and some advanced rules put some meat on the bones of the basic game. It is still fun and fast. It just adds altitude and, naturally, bombers to flesh out the game. The game's premise is very succinct; instead of follow the leader, it is shoot down the enemy leader. The game does not come with a play mat, but none is needed. 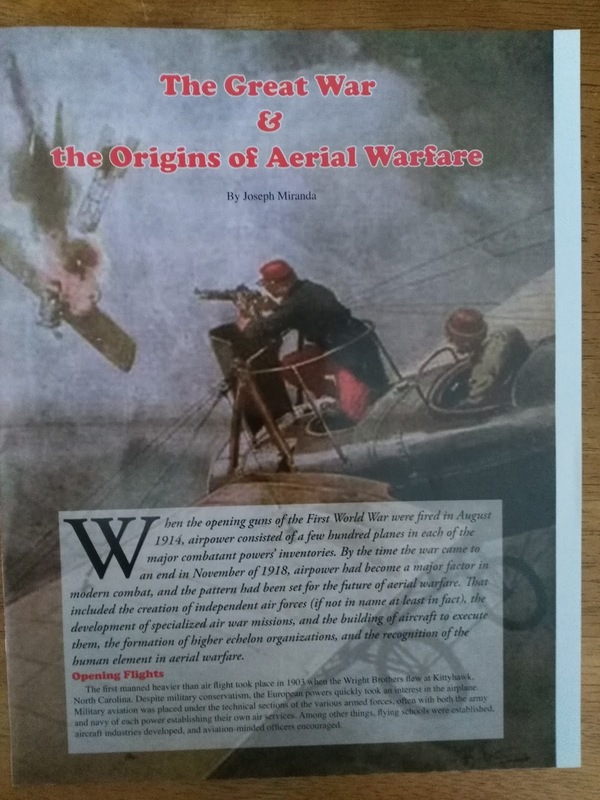 It also comes with a fourteen page booklet called 'The Great War & The Origins Of Aerial Warfare'. This is an excellent primer on the airwar of World War I. 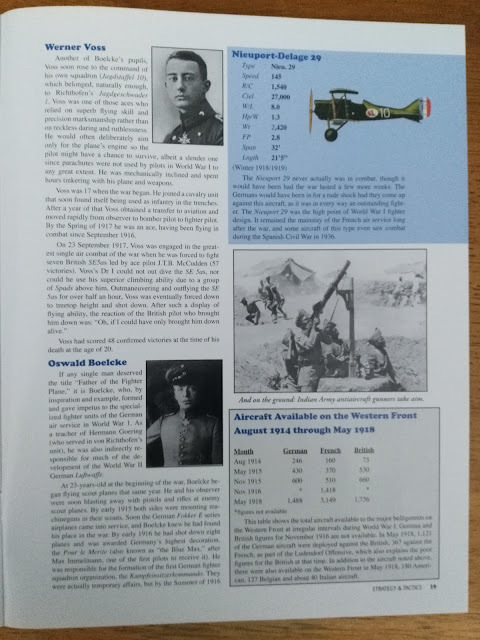 It also includes some plane pictures along with stats and a short history. The most recognized Allied and German Aces are also here with a picture and a short biography. 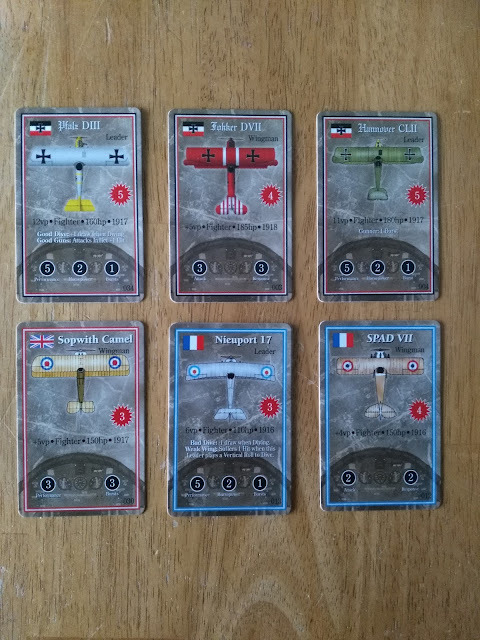 The plane cards are stunning, and show pictures of the planes from above. They are easy to read, and the numbers that are needed for the game are plain to see. These include performance, horsepower, and bursts. The pilot and altitude cards are much smaller, but still clear to the eye. These cards remind me of the small cards of sports figures that long ago came in cigarette packs. Setup: You pick a year and points for each side in the basic game. Both sides secretly choose a leader, and the remaining points are used to pick one or two wingmen. Both your leader and the wingmen must be the same type of plane. The campaigns all take place in 1917 or 1918. 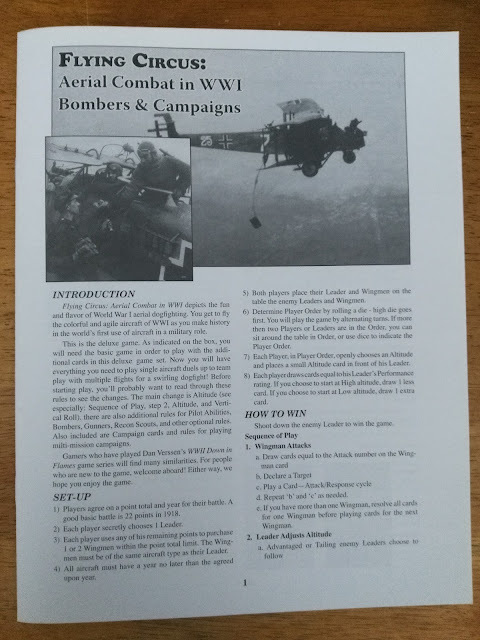 The campaigns list the aircraft you can use, and also have other options for aces etc. BoardGameGeek has a ton of resources for the game. 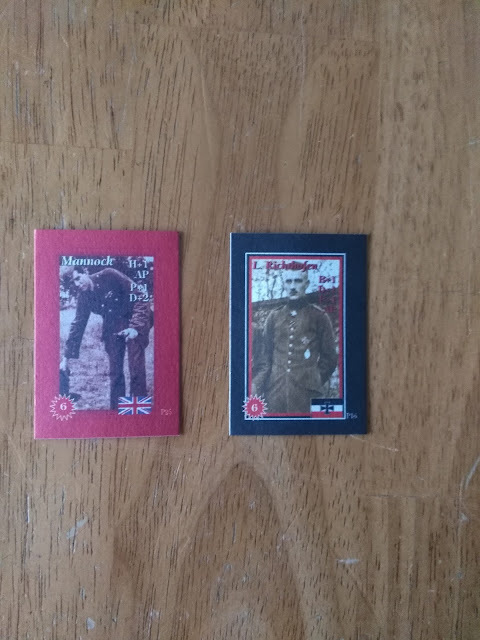 They include a downloadable players aid card, and someone has done some rules so the game can be played solitaire. 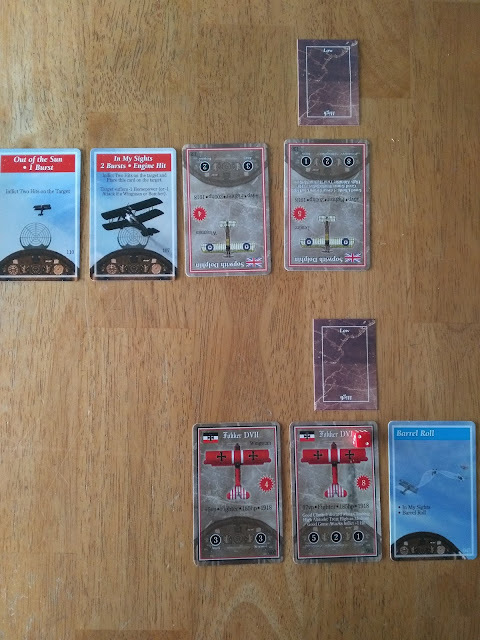 This is just a quick example of play using two 1918 fighters, Fokker DVII and Sopwith Dolphins. I used a die roll to see who went first. The English side won. The Sopwith Dolphin wingman is attacking the Fokker DVII leader. He uses an 'in my sights' card. 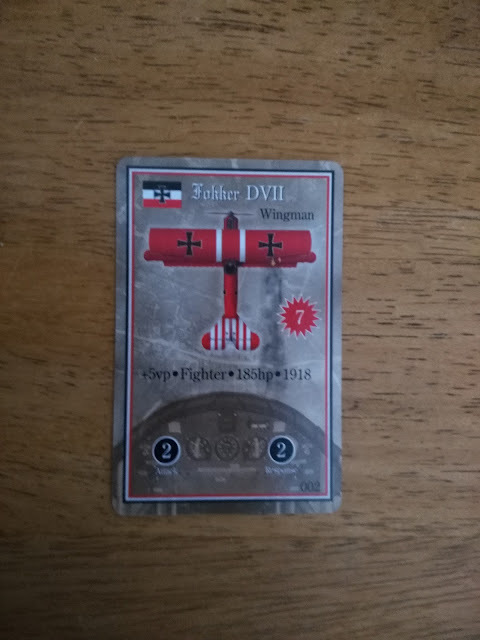 The Fokker leader plays 'barrel roll' to negate the Sopwith's 'in my sights' card. The Sopwith next plays an 'out of the sun' attack card. The Fokker leader does not have any cards to use against the Sopwith's 'out of the sun' card. 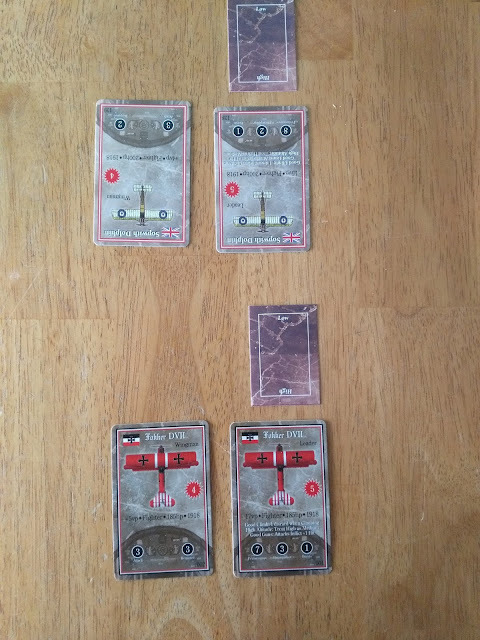 So the Sopwith gets a hit on the Fokker leader for two points. The Fokker leader's card is flipped to its damaged side, and one of the small die is used to show it has two damage points. The game is quick and easy to play. The only complaints I saw about the game were from its original version without the 'Bombers and Campaigns' add on. This deluxe version added in altitude and some other game mechanics that really makes the game better. For someone looking for a World War I aerial game that doesn't want to look at charts and tables for an hour, this game is perfect.The rules could have been a little more clear on some points. I used the items on BGG and some videos to fill in the blank spots in my mind. Once I understood the rules (which could have been me-remember, this is my first card game), I was able to play and enjoy the game fully.